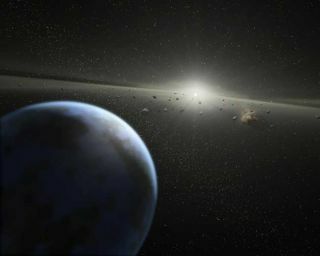 An artist's impression of a massive asteroid belt in orbit around a star. The new work with SDSS data shows that similar rubble around many white dwarfs contaminates these stars with rocky material and water. At 150 light-years from Earth, the Hyades cluster is the nearest star cluster to Earth's solar system and scientists have long wondered if some of those stars are home to alien planets. Now, that particular mystery might be solved. Astronomer Ben Zuckerman, a physics and astronomy professor at UCLA, and his team have discovered evidence that the atmosphere of a white dwarf star in the Hyades cluster is "polluted" with rocky material from pulverized asteroids pulled into orbit around the dying, super-dense star. The presence of asteroid dust, Zuckerman said, suggests that larger objects like exoplanets, or possibly an entire solar system, may also be orbiting the white dwarf. Usually, white dwarf atmospheres are relatively "clean," Zuckerman said in the Jan. 8 presentation. Because the heavier elements in a dying star clump in the core, only light elements like helium and hydrogen are left swirling in the atmosphere. By using a very sensitive spectrometer at the Keck Observatory in Hawaii, the team detected hints of calcium in the atmosphere of the star in its death throes. "We looked at calcium because it’s the easiest element to detect in these stars," Zuckerman said. John Debes of the Space Telescope Science Institute was able to confirm that the dust came from asteroids and not from another source by matching the team's new observations with earlier ones. Zuckerman described how the star would have become polluted by asteroid dust: "The gravity of the major planets perturbs the orbit of some of the asteroids in towards the white dwarf," he said. "They don't actually have to hit the white dwarf, but they have to get within the tidal radius of the white dwarf, and if that happens, then they get torn apart, torn asunder into little dust grains." Once the asteroids are pulverized, they will start a new orbit, crafting a new planetary system around the white dwarf. Of the 50 to 100 polluted white dwarfs Zuckerman's team has studied, it has detected more than 10 heavy elements in the atmospheres of many of the stars, he said. The most abundant elements detected in these accretion discs — oxygen, silicon, magnesium and iron — are also the most abundant elements found in the Earth. The team also found some less common elements circling the distant stars. "I didn’t even know that scandium was an element until we discovered it in the atmosphere of a white dwarf," Zuckerman said. Based on observation and statistical analysis, Zuckerman thinks that at least one quarter of white dwarfs could be polluted with accreted dust, giving researchers the chance to study the insides of asteroids outside of the solar system.